Imagine if Brett Kavanaugh had offered his emotional, tearful, you-ruined-my-life opening speech to the Judiciary Committee — and then called for a quick FBI probe to clear his name and perhaps find the true assailant. Imagine if it were he who volunteered to endure another week of scrutiny and attacks for the good of the court, the country, Dr. Ford. He would have looked confident, humble, even a tad heroic, given the president who nominated him opposed the FBI probe. Instead, they were forced reluctantly and publicly into what should have been a fairly easy-to-anticipate moderate compromise: agree to a vote after a quick FBI probe. Republicans, from the earliest days of the allegations, were overly confident they could just jam this through, several people involved the process tell us. 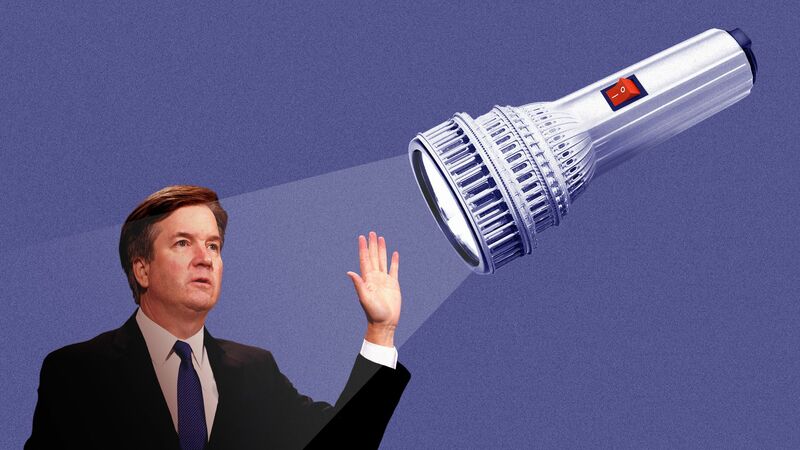 They thought he would be better defending himself — and that Dr. Ford would seem less credible. Republicans treated this like a bare-knuckles political fight. They calculated a Fox News appearance, a Trump endorsement, a headstrong Mitch McConnell, a fired-up base, a fast vote would hold the party together. In the GOP’s defense, the strategy might have worked had Sen. Jeff Flake (R-Ariz.) not changed his mind at the very last minute. "I’m a conservative. He’s a conservative. I plan to support him unless they turn up something — and they might." 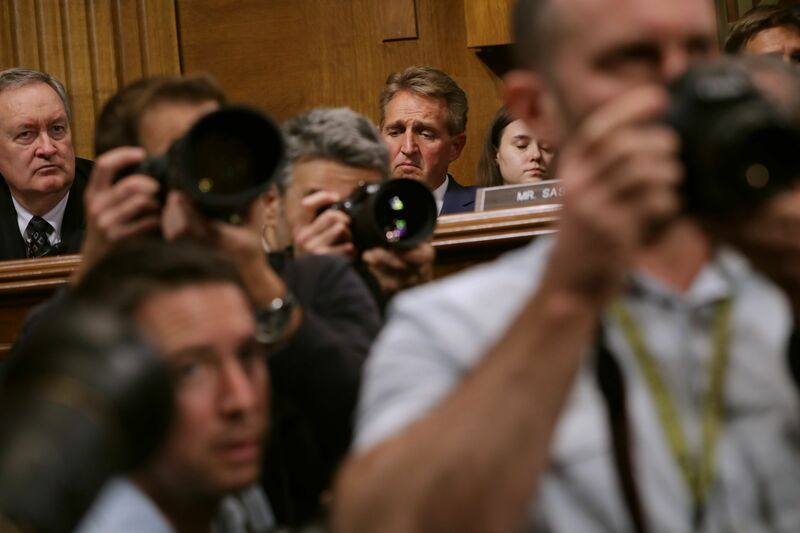 Above, Senator Flake listens to fellow Judiciary Committee members debate the Kavanaugh confirmation. 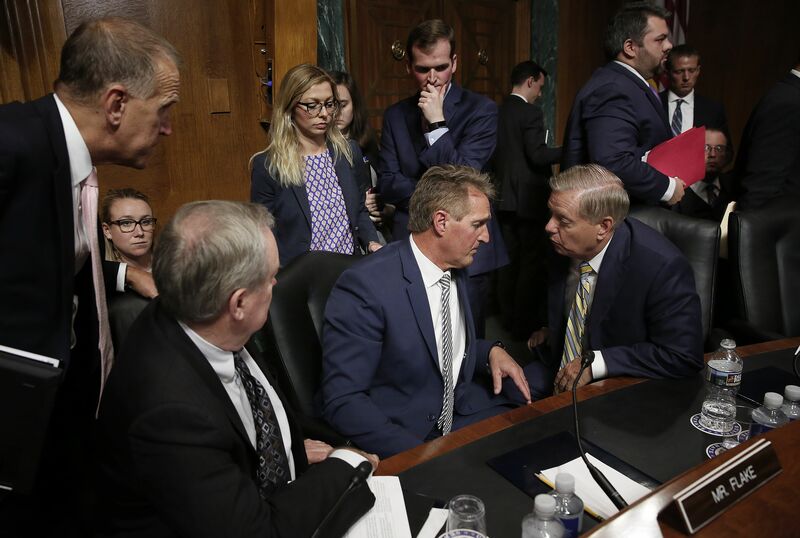 Below, Republican members of the committee surround Flake as he huddles with Sen. Lindsey Graham of South Carolina. "We ought to do what we can to make sure we do all due diligence with a nomination this important. This country is being ripped apart here." "On Monday, I stood in front of your office ... I told the story of my sexual assault. I told it because I recognized in Dr. Ford’s story that she is telling the truth. What you are doing is allowing someone who actually violated a woman to sit on the Supreme Court. This is not tolerable." "You have children in your family. Think about them. I have two children. I cannot imagine that for the next 50 years they will have to have someone in the Supreme Court who has been accused of violating a young girl. What are you doing, sir?" "Look at me when I’m talking to you. You are telling me that my assault doesn’t matter, that what happened to me doesn’t, and that you’re going to let people who do these things into power. That’s what you’re telling me when you vote for him. Don’t look away from me. Look at me and tell me that it doesn’t matter what happened to me, that you will let people like that go into the highest court of the land and tell everyone what they can do to their bodies." Reporter: "Do you want to respond, Senator Flake?" Flake to protester: "Thank you." Protester: "No, no thank you. What do you think?" Reporter: "Senator, do you care to respond?" 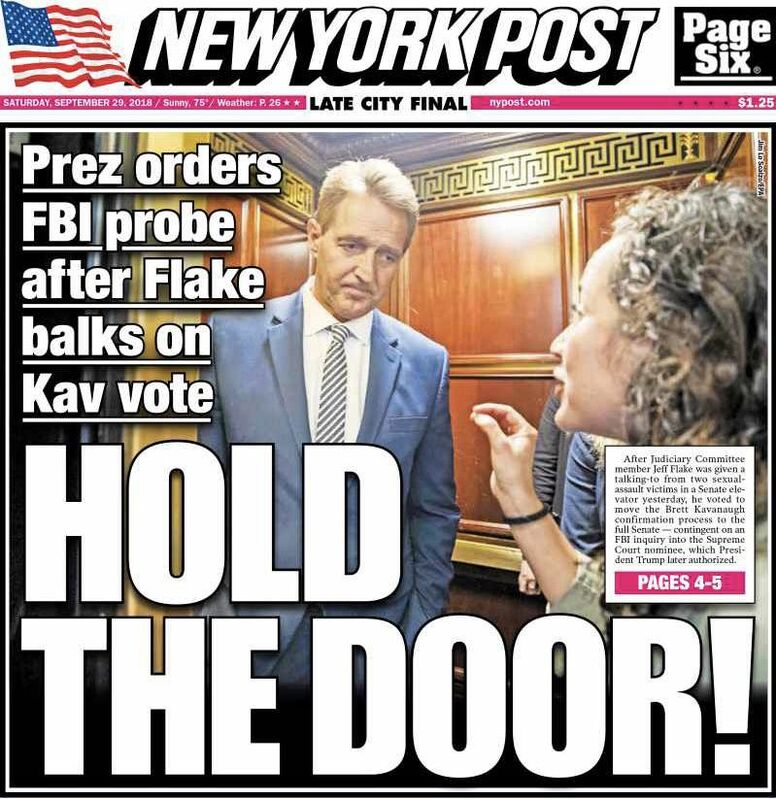 Flake: "I need to go to the hearing." Protester: "I understand, but tell me. I’m standing right here in front of you. ... [D]o you think he’s telling the truth?" Facebook crossed into new territory yesterday as it publicly disclosed a massive security breach that gave away the keys to as many as 50 million Facebook user accounts, Axios' David McCabe writes. The disclosure came just months after CEO Mark Zuckerberg said he didn't think such an event had ever occurred on its platform. Why it matters: The Cambridge Analytica scandal was about gaming Facebook’s systems to scrape user data. This is something different: what looks like the biggest intrusion in Facebook history, taking advantage of flaws in its own code. The breach will have an impact beyond Facebook. The company revealed that if a user's account was compromised, the same access would be available to any other services a user accessed by logging in with Facebook. Slack — the popular workplace instant-messenger, with more than 8 million daily active users (including all of us @Axios) — is preparing to go public next year at a valuation well in excess of $7 billion, per The Wall Street Journal. Why it matters: After years of staying private, tech companies "are now increasingly being drawn toward the IPO market, ... one of the best in years." "That includes such programs as 'Grey’s Anatomy,' entering Season 15, and 'The Simpsons,' entering Season 30. Viewership for each of these shows is down more than 70 percent from their all-time highs." "A dying TV show in 2018 doesn’t keel over as much as wander through an endless night." 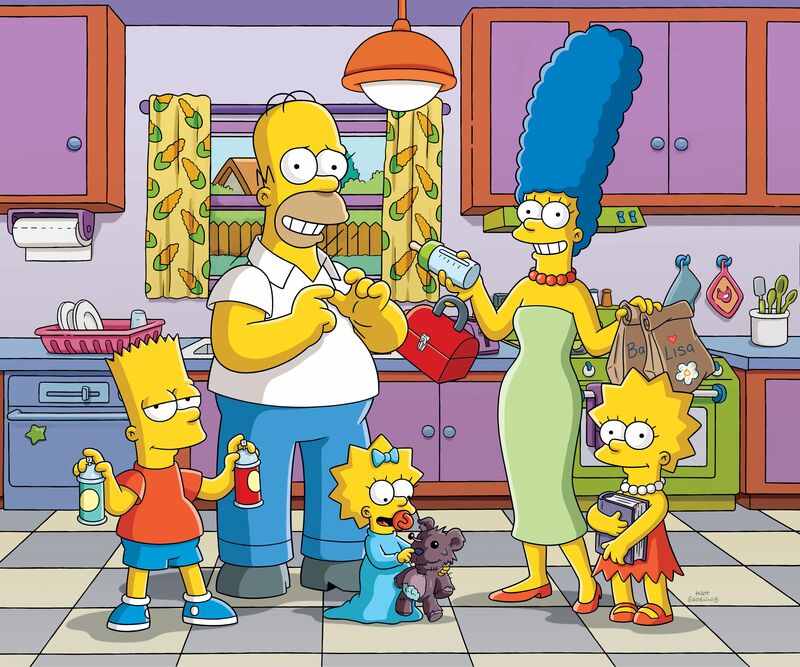 Go down the rabbit hole: The N.Y. Times divides the first 29 "Simpsons" seasons into five eras ("The Prime" is seasons 3-8), with an iconic episode for each.